Happy Monday! I hope y'all had a great weekend! If you're following me over on Instagram and you watch my stories, then you know how big of a foodie I am! I absolutely love to eat and I especially love to try new foods, which is one of the main reasons I love Disney. There's so much good food! 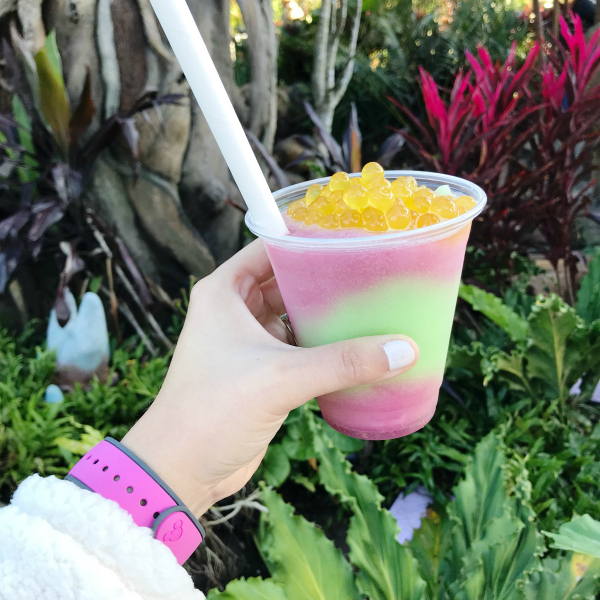 Today, I am going to share some of our favorite food stops, what we ate, and my biggest recommendations for your next trip to Disney World. We did six days in the parks and stayed at a Walt Disney World resort but we did not get any type of dining plan. There are several reasons for this but mainly it's because we wanted to try lots of different things (particularly quick serve meals, snacks, and treats) plus our kids don't eat a lot. They often just share one kids meal because they snack all day long! Remember, at Disney you can pack your backpack full of your own snacks (which I will talk more about in Thursday's Disney 101 post). We only did one "sit down" meal but it was still a quick service at Be Our Guest. Breakfast and lunch is quick service there but they do offer table service at dinner. Breakfast is pricey if you don't have a dining plan so I would recommend getting a lunch reservation there if you're not getting a dining plan. It's absolutely beautiful in there! We did have to secure our reservation about sixty days in advance to get it but check back often because times do open up as other people change their plans. By the time we got to Orlando on Christmas Day, we were starving! We checked into our hotel and then headed straight to Disney Springs for an early dinner. We got custom pizzas at Blaze Fast Fire'd Pizza and it was absolutely delicious! The prices were super reasonable (under $10) for a pizza with unlimited toppings! You could share one of these but I was starving and ate this entire thing! I have been so excited to try Gaston's Tavern since we didn't have time to go there on our last Disney trip. We got a cinnamon roll and the LeFou's Brew. The cinnamon roll looks better than it tastes (it's not terrible but nothing amazing) but the drink was yummy. It was kind of like an apple slushie with a passion fruit flavored whip cream on top. My youngest daughter loved it! This is another food item that I have been wanting to try since our last visit. 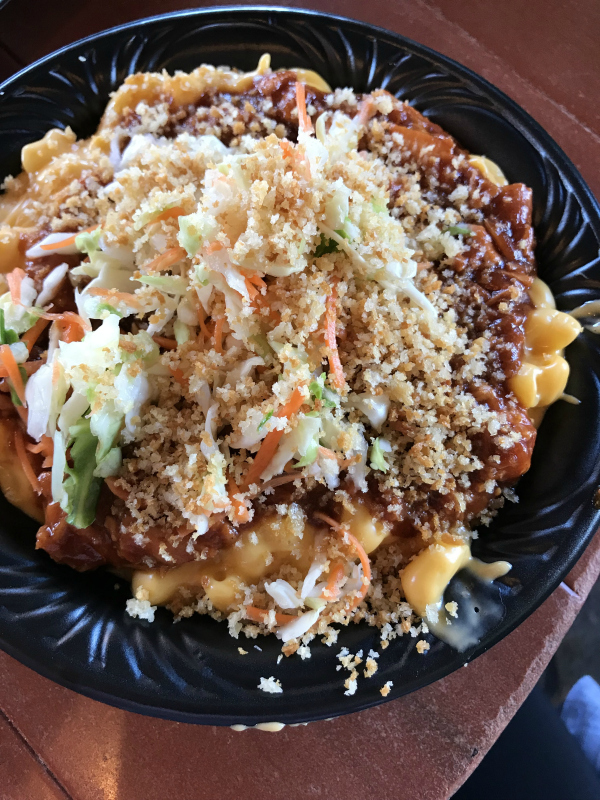 It's the barbecue chicken macaroni and cheese at The Friar's Nook. We ate this twice so yes, I would definitely recommend it! It's super filling so my husband and I shared this for lunch and my girls shared a plain mac and cheese. 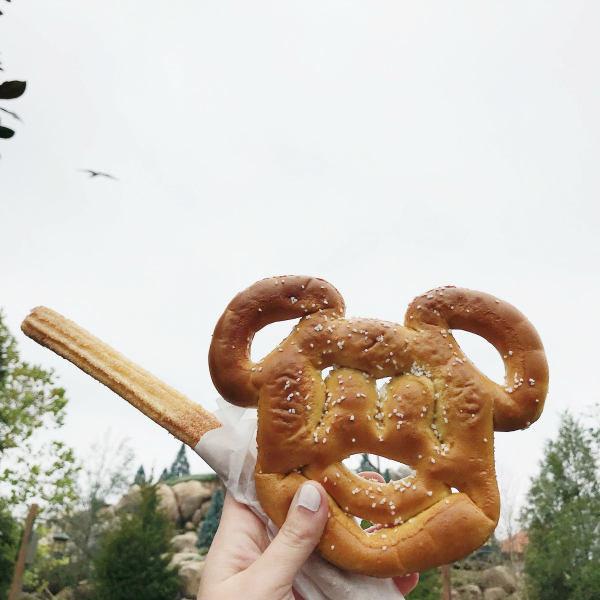 You can find churros and Mickey Mouse pretzels all over Disney World because they are delicious! They are both perfect for a quick snack between meals. Everything is better Mickey shaped! Sleepy Hollow is a must stop at Magic Kingdom! 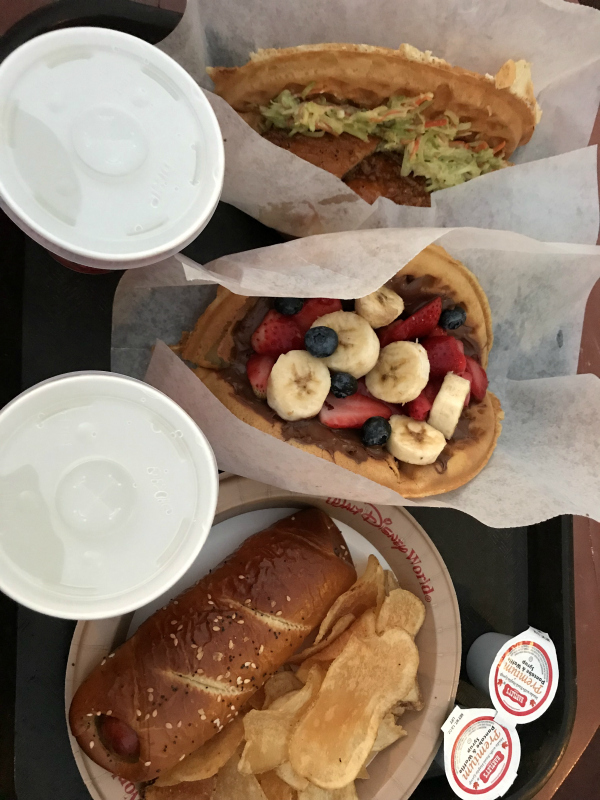 We got the spicy chicken and waffles sandwich and the nutella waffle with fruit. They were both super delicious! My girls shared the pretzel bun hot dog and they gave it two thumbs up. Another money saving tip is to get cups of water when you order because it's free and I like free over a three dollar bottle of water any day, lol! Epcot is literally a foodie's dream come true! This food above my my most favorite out of all of the many places we ate at during our trip. The flavor was amazing! 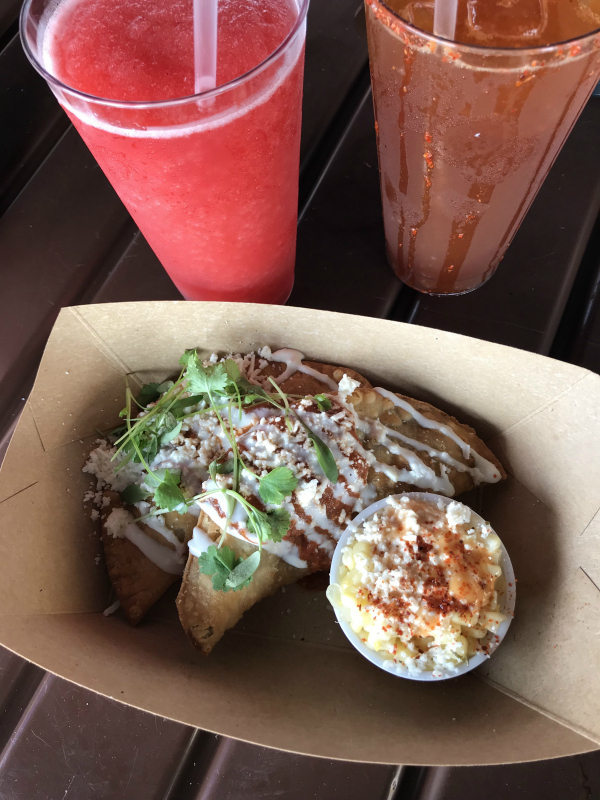 Be sure to stop at Choza de Margarita while you are visiting Mexico at the World Showcase in Epcot. Don't be mislead by the name, they have more than just margaritas (I mean, the margarita was amazing too)! We had the empanadas and they were seriously incredible! 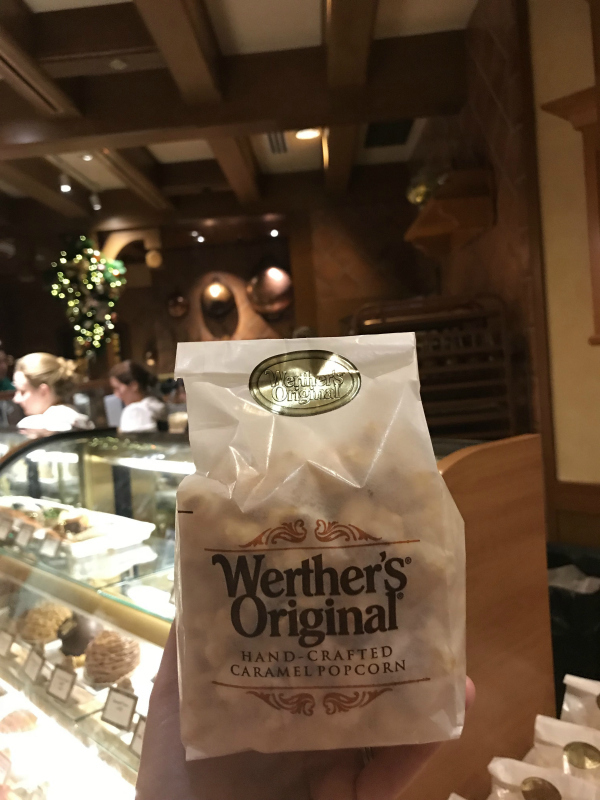 While you are in Germany, you have to stop at the Werther's shop to get some fresh caramel popcorn. I read about this place on a Disney food blog so I knew I needed to try this out. They make the popcorn fresh and then cover it in my warm caramel. It's even still warm when they put it in the bag for you. I can't even explain how yummy this is! We got the small bag but after we devoured it in minutes, I wish we would have purchased the large bag. It's that good! This treat is another hidden gem that can be found in France! 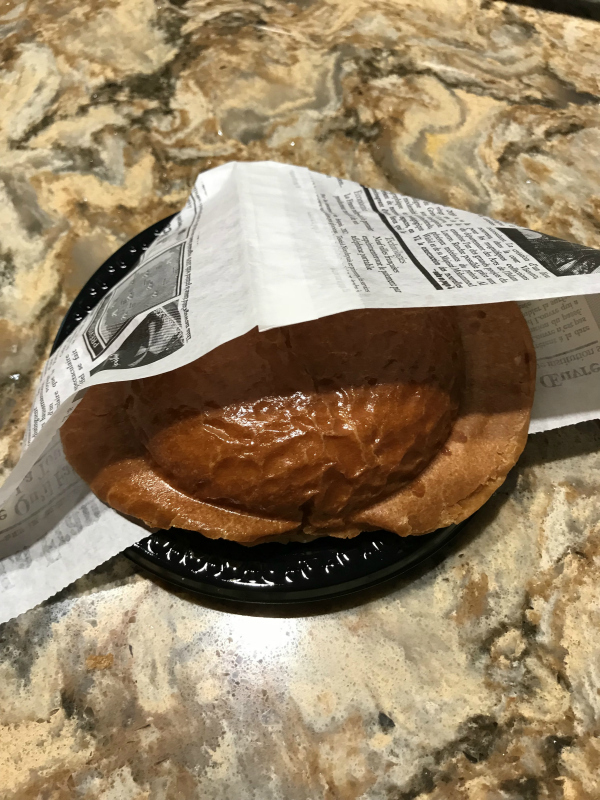 Be sure to stop by L'Artisan des Glaces for the Croque Glacé, which is one scoop of ice cream with choice of sauce in a homemade brioche, pressed warm. I got the cinnamon ice cream with raspberry sauce. This is such a delicious treat! Hollywood Studios honestly has the worst food selection out of all four of the parks. 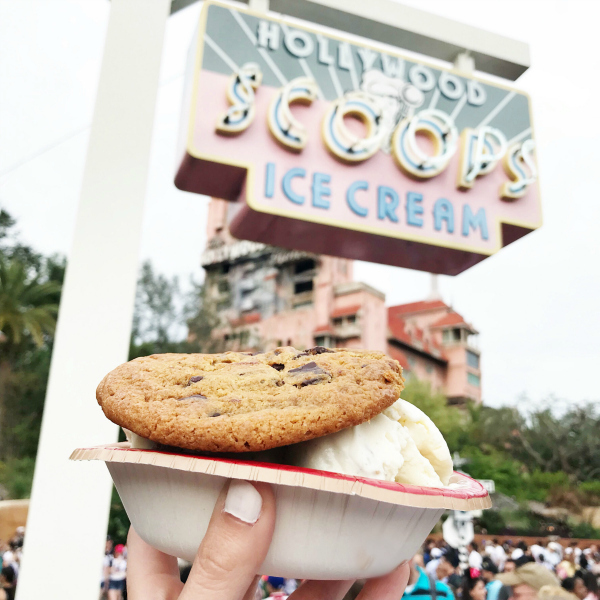 Besides this delicious ice cream cookie sandwich from Hollywood Scoops, there wasn't much else to get excited about there. There are a few great table service restaurants there though so I would recommend getting a reservation at 50's Prime Time Cafe or Mama's Melrose's Ristorante Italiano for more unique and delicious dining options. 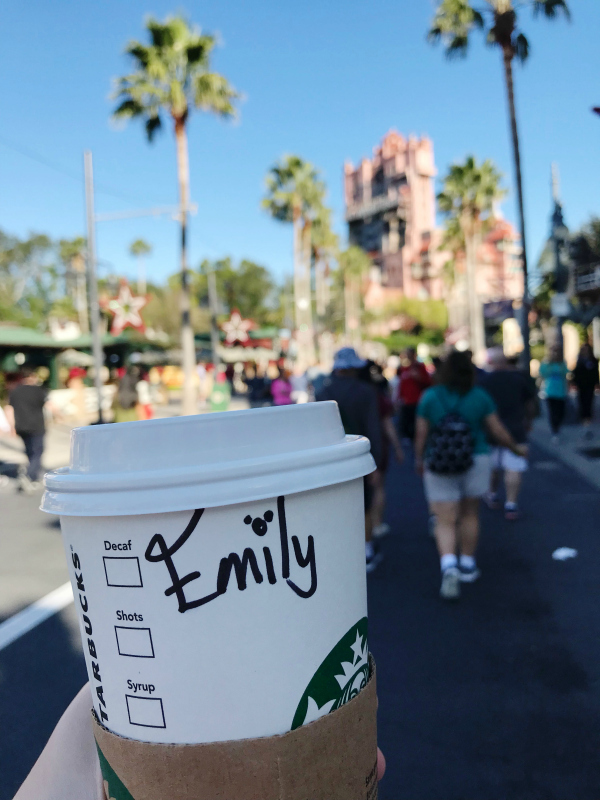 Thankfully, there is a Starbucks located in each one of the parks. I needed the extra caffeine! 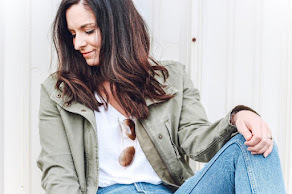 My go-to drink is a venti skinny caramel macchiato! 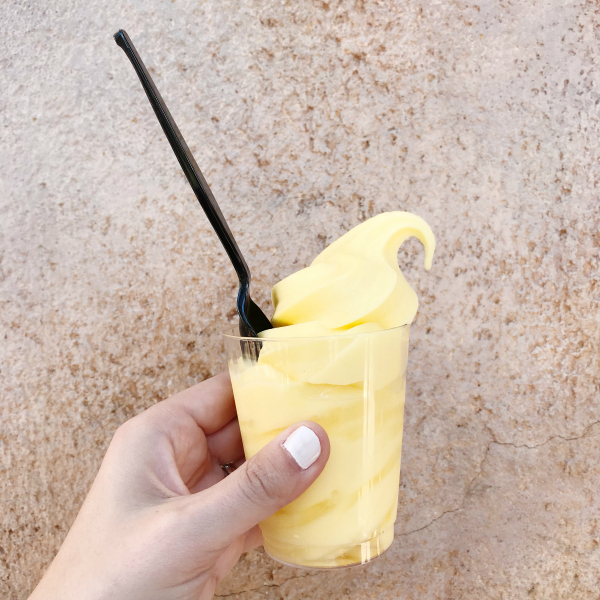 I never got a Dole Whip in Magic Kingdom because you can get one with coconut or dark rum at Tamu Tamu Refreshments in Animal Kingdom! 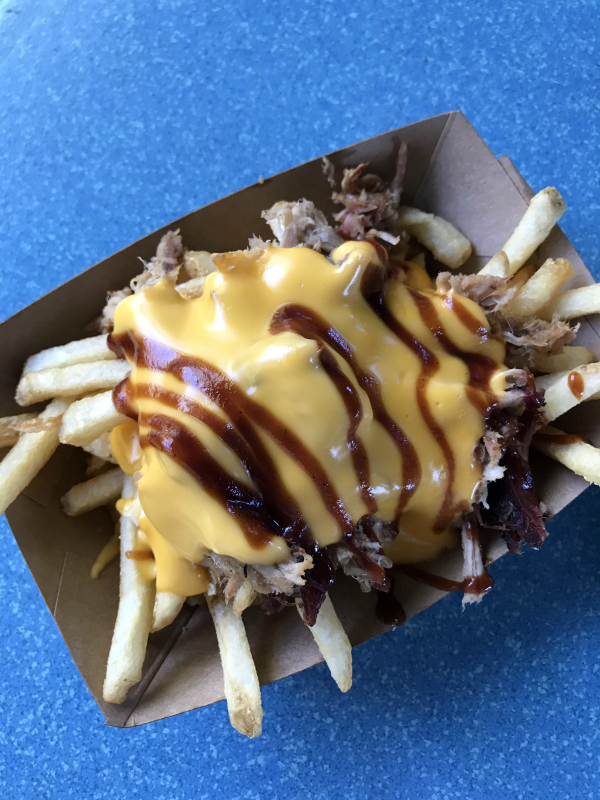 These cheese fries from Flame Tree Barbeque were delicious! My only problem with them is that I wish they gave you more! We absolutely loved the new Pandora area at Animal Kingdom. It's amazing! We ate at Satu'li Canteen for dinner the night we were there but I didn't get a good picture of our amazing food. We had the Chopped Wood-Grilled Chicken Bowl. You can choose your own toppings and sauce. It was so yummy! Also, you must try Pongu Pongu, which is located near the exit to the Avatar Flight of Passage ride. We tried the Night Blossom, which is a mixture of limeade with apple and desert pear flavors topped with passion fruit boba balls. It's perfectly sour and sweet! Thanks so much for stopping by! Also, be sure to check out my Disney Style post from last week in case you missed it! Have a great day! Yummy! I think I'd like to go to Disney even if it was just to try all this delicious looking food! ;) Thanks for sharing. Love how you guys surprised your girls with such an awesome Christmas Present! !